At dawn on Dec. 18, 1961, squadrons of Indian Air Force bombers crossed a border, bombed an airfield and a communications site. Paratroopers, tanks and artillery crossed that same border on the ground, intent on seizing territory. But the ground they invaded wasn’t Pakistani or Chinese. Rather, it nominally belonged to Portugal — and had for more than 400 years. The Portuguese seized the province of Goa, along with the smaller enclave of Daman and the Island of Diu to the northwest, during the colonialism of the 1500s. Taking advantage of the weakness of the fragmented Indian states, Portugal not only grabbed these territories but held onto them in the subsequent wars between England and France for control of India. Perhaps more surprisingly, the Portuguese retained that control throughout the period of the British Empire and the Raj. After World War II, the British decided to leave and an independent India was born. Even after the British withdrawal the Portuguese remained, stubbornly refusing to cede their long-held territories. Times were changing, however and the era of colonialism and empire were over. Aside from Goa, Daman and Diu, all Portugal had left were colonies in Mozambique and Angola. The problem languished through the 1950s and eventually became an issue in Indian domestic politics. Citizens wondered why India didn’t evict such an obviously weak European power, but Prime Minister Jawaharlal Nehru avoided doing so for several reasons. First, India was engaged unifying the nation after independence, including military actions in Kashmir and Hyderabad. Second, there was a nationalist movement in Goa, but it was supported by political rivals such as the Communist Party of India and the Praja Socialist Party. Nehru’s unwillingness to take action on Goa related to his dislike of these rival political parties. Third, India gained its freedom largely through a policy of nonviolence and using military force any more than necessary appeared hypocritical. As the years went by Nehru hoped the Portuguese would take from the British example, give up and go home. There was occasional pressure and in August 1955 Portuguese police brutally suppressed a peace march, killing 22 and wounding 225. Despite this there was no movement on the issue. By 1961, however, India was stable and the call for the reclamation of Goa was growing. Nehru had to act, and like many leaders beset by internal strife, he chose to take military action against an external power, in this case an occupier of Indian land. Nehru decided on the attack in late November 1961, but had already ordered the Indian armed forces to prepare a plan months earlier. The air force began training as early as June while the navy carried out exercises off the Goa coast. Portugal and the world noticed the activity and complaints and cautions from the West were numerous. Even U.S. Secretary of State John Foster Dulles warned India not to use force in Goa, though he stopped short of supporting the Portuguese occupation. There was also the threat that Portugal, as a NATO member, might call on that organization for military support if India attacked. At the same time, several African nations admonished India for not leading the resistance against Portuguese colonialism. In the end, the risk the United States or NATO would intervene militarily to assist Portugal’s crumbling overseas empire seemed minimal. In an added political twist, at the time Nehru was also fighting a stiff electoral battle with a socialist candidate in Bombay. The operation to reclaim Goa advanced both his nation’s and his own political interests, so it was approved and ordered. Portugal suspected the coming attack and made what feeble preparations it could. Portugal’s prime minister ordered the local governor, Manuel Antonio Vassalo E Silva, to fight to the last man. His forces amount to roughly 5,000 troops, a few small warships and the police. Against this the Indians pitted a reinforced division with armored support, covered by squadrons of fighters and bombers. The Indian navy committed an aircraft carrier, a pair of cruisers and six frigates. The actual operation was almost anticlimactic. India’s major objectives fell within a day and the Portuguese troops quickly surrendered, often without a fight, ignoring a ridiculous “fight to the last man” order. Indian troops frequently bypassed surrendering Portuguese in order to get to the main cities and secure them. The Indian navy and air force bombarded the meager defenses into submission and the initial bombing attacks severed Portuguese communications. This doomed the defense, leaving it uncoordinated. Individual Portuguese units were isolated, without a clue what was happening elsewhere. Combat broke out in a few places, however. Assigned to attack Diu Island, the 20 Rajput Regiment advanced without waiting for the full aerial and shore bombardment of the defenses and were repulsed by heavy machine gun fire as they approached in their assault boats. More air strikes were ordered and the cruiser Delhi moved within two miles of the island, shelling the defenders and forcing their surrender. 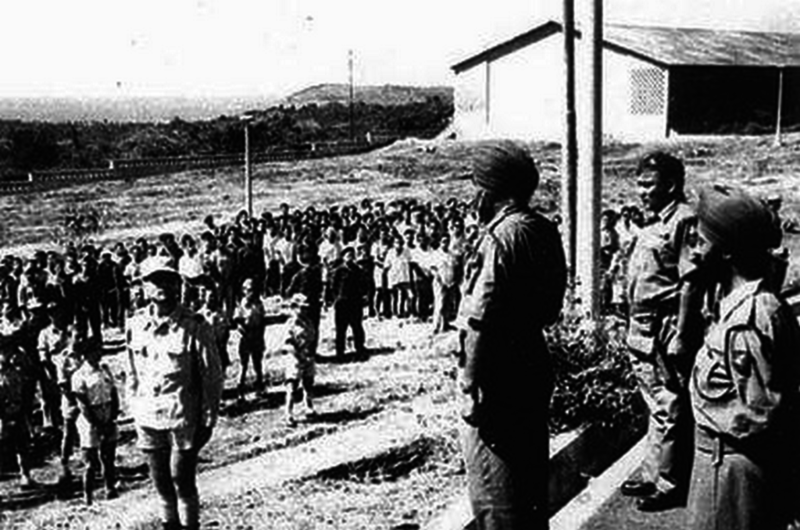 In Goa Indian troops of 7 Cavalry Regiment tried to negotiate for the release of some civilian prisoners when a firefight broke out, killing several of them. In all the Indian military lost 22 killed and 54 wounded while Portuguese losses amounted to 30 dead and 57 wounded. It was perhaps more embarrassing to Portugal that 3,000 of its troops became prisoners. International reaction was a mix of condemnation from the west and words of support from Africa and even the Soviet ambassador. The United States condemned the operation, but still dealing with the failed Bay of Pigs invasion, did little else beyond a few sharp comments and threats to cut aid. U.S. public opinion turned against India for a few months but relations soon resumed. Portugal and India settled the matter in a 1974 treaty. Today the incident is little more than a post-colonial footnote.